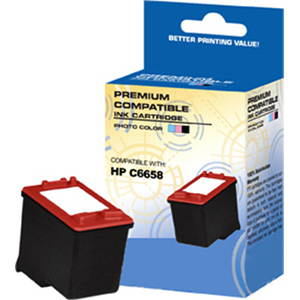 This high-quality compatible replacement cartridge been tested with the following models with 100% compatibility assurance: HP DeskJet D2360, F380 AiO, 450ci/cbi/wbt, 3620/v, 3650/v, 3651, 3843, 3845/xi/3847, 5150/w, 5550/5650/w, 5850/w, 9650, 9670, 9680, Photosmart 7150, 7350, 7260/v/w, 7450/v/xi, 75, 7660/v/w/xi, 7755, 7760/v, 7960/w, PSC 1311, 1315/v/xi, 1350/v/xi, 2110/v/xi, 2175/v/xi, 2210/v/xi, 2410/v/ --- NOW PRINT MORE, SPEND LESS ON INKJET AND TONER CARTRIDGES --- All Trademarks are property of their respective owners. All model designations are for compatibility purposes only. Click the button below to add the HP Compatible Permium Inkjet Cartridges Replaces HP C6658AN #58 to your wish list.